Just A Scrappin' challenge for Oct. 18th is ANYTHING GOES. 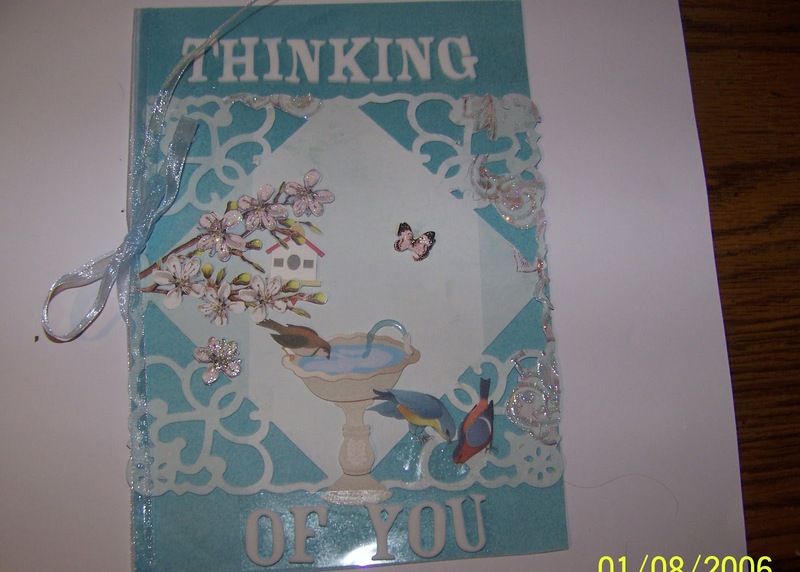 I have made a Thinking of You card for a lady who went back into the hospital with cancer. Her husband has worked here at the retirement community for 20 some years and everyone knows them, they are really good people so this one is special. I'll collect as many signatures as I can. 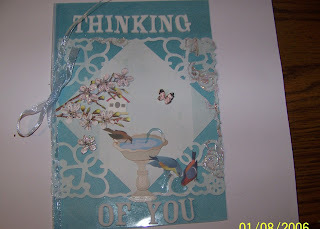 I used the Art Philosophy Front Layer <stocking> at 5 1/2 inches on Best Creation Glitter timed two toned blue card stock for the center. Layered onto blue paper from my stash using stickers from Jolee's boutique (birds) Thickers (Rockabye) and flowers on branches from stash. The blue organdy ribbon is by Jo-Ann. All on white card stock base. Hope you can play along with us this week at Just A Scrappin'- look for some Blog candy!